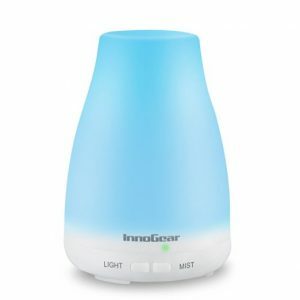 Recently I was walking by a co-worker’s office and saw an InnoGear Essential Oil Diffuser on his desktop. The unit had a mist wafting out of the top of it and it glowed with various colors. So I had to stop and ask him about it. I forget why he actually bought it but he said he loved it because it added a little extra moisture to his office cubicle during the dry office days of winter. I oftentimes get ideas for various products for my own office from looking in co-workers offices. This is a perfect example of that. 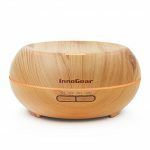 What I learned after researching the InnoGear Essential Oil Diffuser was that these oil diffusers are extremely popular these days not only when it comes to office décor but when it comes to home décor. 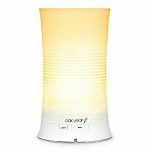 A lot of people use these diffusers in their child’s bedrooms to help them sleep at night. 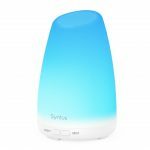 Others use it to mask the smells of animals by using various essential oils. So, I took the plunge and decided to pick one up for my own office cubicle. It is extremely easy to use and set up. It’s simply a matter of plugging it in, adding water, and turning on the buttons for the lights and for the mist. Here is a quick youTube video I made of me unboxing the unit and showing you how to use it. Automatic shut off when water runs out. Mist has intermittent and continuous mode.